Not many neighbors know it, but Multnomah Village has become a hub for amateur and professional woodworkers. The Guild of Oregon Woodworkers, with its 750 members, has made the Village its home. Some woodworkers come from as far away as Salem, Forest and Vancouver, Wash., to work in the Guild's two-room, tool-packed space that also has a small library. The no-nonsense facility is tucked away around the corner from Starbucks on Southwest 34th Avenue. Friendly and helpful, he's a personification of the Guild itself. I found him in the "bench room," where the walls are lined with chisels, saws, planes, mallets and various other woodworking tools. Behind him, two Guild members were finishing a stool sitting atop a workbench. From the adjacent "machine room," we could hear the whirr and whine of routers, planers, jointers, drills and table saws. The room features industrial-quality tools. One member described it as "a woodworker's dream shop." Whatever room you are in, safety is a top issue. Members wanting to use the power tools are required to take a safety and orientation class. And yes, before using the shop, you must pass a hands-on test demonstrating an understanding of safe tool operation. Eye protecton is mandatory. Bulbous ear protectors make everyone look vaguely like aliens in a sci-fi movie. Ferguson, who sits on the Guild's board, explained that prior to three years ago, when the Village space became available, Guild members gathered at Franklin High School to hold meetings and present the occasional class in the school's large woodworking shop. The move to the Multnomah facilities has been a boon for the Guild, more than doubling its membership. Ferguson says that the organization has also seen a growing number of women enter what was once primarily a man's domain. Volunteerism is hammered into the Guild. Ferguson, a volunteer in his supervisory role, ticks off a list of "doing good by doing wood" projects. For example, that rasping noise in the next room comes from a saw making parts for 225 children's birdhouse kits. The kits will be assembled by children at Multnomah Days in August and at the Clackamas County Fair. Building projects for the community with donated labor is a charter calling for the Guild. The new display case in the Multnomah Arts Center is an example. The list goes on and on: "Toys for Tots" for needy kids, dressers for a homeless shelter, "gondola" book display carts for the Happy Valley Library, a bench for the Raleigh Park School library. All the projects, whether individual or community projects, are inspired by a love of wood. The Guild's extensive web site (guildoforegonwoodworkers.org) reveals where that passion can take Guild members. 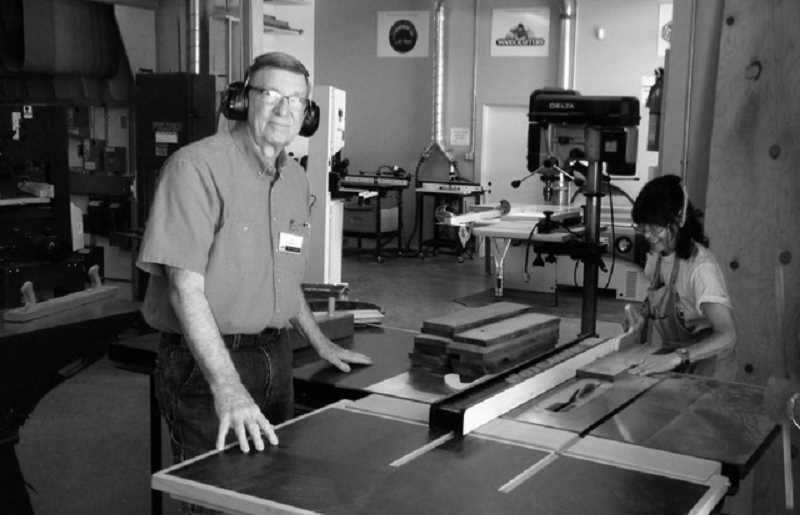 Consider the list of course offerings and events: Basics of Fine Woodworking, Fundamentals of Cabinetry, Things to Consider Before You Start a Project, Japanese Woodworking, Advanced Jigs, Bench Tools Sharpening Clinic, Box Making, Building a Wall Cabinet and Drawers, Chair Design and Construction. There's even one titled "Repairing Common Mishaps in Woodworking." Lessons learned in the shop can be used outside it. Who doesn't need a class in "Repairing Common Mishaps in Life?" The guild offers more than 100 classes per year. I asked Ferguson how the Guild approaches the topic of finishing wood. He gave me a wide smile and an "are-you-kidding?" shrug that says, "Where to begin!" The Guild is supported by several sponsors related to woodworking supply and support — firms like Goby Walnut Products, Hardwood Industries, North Woods Figured Wood, Rockler Woodworking & Hardware. But also on the list is Catlin Gabel School and Oregon College of Art and Craft, both schools with woodworking offerings. Annual membership dues seem a bargain at $45, which includes a host of benefits, all listed on the web site. Then again, you don't have to join to just drop by the shop and say hi to Ferguson and his friends. The woodworkers, after all, are your neighbors.